The Sovereign 3 scooter is a three wheeled scooter at home both indoors and out. This highly manoeuvrabe scooter is suitable for longer outdoor excursions, easy safe controls give a smooth operation with ten different speed settings up to 4mphh (6kmph). Direct drive rear wheels and electromagnetic disc brakes provide a safe and comfortable ride. Battery level warning lights give you advance information of the power remaining in the batteries. 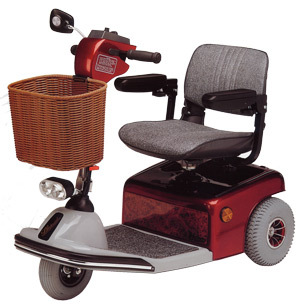 A free wheeling device allows the scooter to be pushed with ease if required. The Sovereign 3 can be easily dismantled without tools for easy transportation.